Charles Kim is Associate Professor in History Department at the University of Wisconsin-Madison. He joined us on November 2, 2017, to talk about his new book Youth for Nation: Culture and Protest in Cold War South Korea. His book explores the South Korean transition period from post-Korean war to Park Chung Hee era, and traces the construction of national identity, which was necessary with the postcolonial nation-building process. During this period, South Koreans were easy to mobilize, making it possible for the Park regime to implement anti-communist ideological training. Youth for Nation is divided into two big parts: “student vanguard” and “wholesome modernization”. The youth were privileged groups that symbolized hope for the new nation, and were targeted for instilling nation-centered ideology. They served as model patriotic subjects for other countries. As the students were seen as a protected group, the protests that occurred against the dictatorship often used students as vanguards to decrease the level of suppression. Though, it was true in many cases, leaders of the demonstrations were students themselves. The students received two types of education. The everyday form of education taught students to be dutiful national citizens. On the other hand, the extraordinary form taught them to become combative and to question the corruption of the ruling classes as they were referred to the anti-Japanese movement on March 1st, 1919. South Korean youth were able to develop a unique Cold War-period South Korean national identity that has left remnants on the public to this day. There was a huge influence of Euro-American culture at the time in South Korea as well as a movement towards modernization. With the emphasis of developmental happiness, the modernization in South Korea was fast-paced but also wholesome. It taught people about the romance of delayed gratification. This type of modernization allowed Park Chung Hee’s National Citizens Reconstruction Movement (1961-1964) and, following that, the Saemaeul Undong (New Community Movement) to successfully take place. These political initiatives focused on the improvement of basic living conditions and environment in South Korea through frugal lifestyles and having all South Korean citizens collaborate on rural development projects. 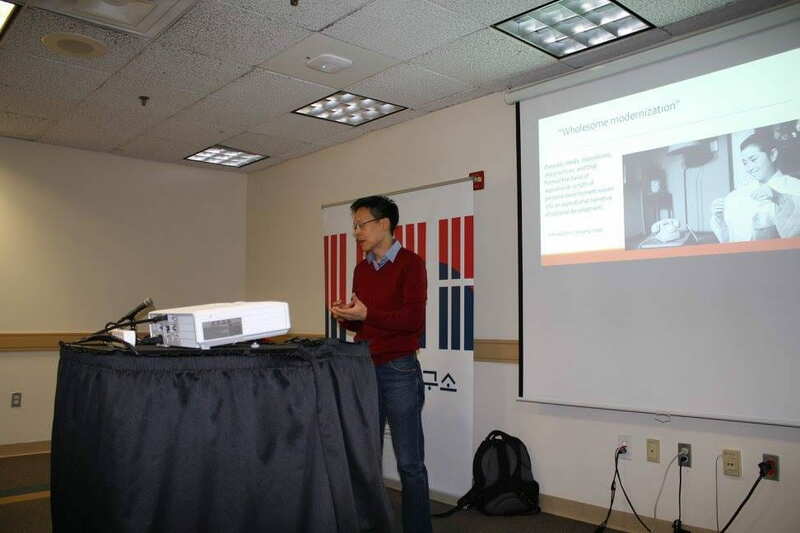 Kim ended his talk by identifying some traces of the “wholesome modernization” in the current days of South Korea. He said that the candlelight protests in 2016-2017 against Park Geunhye’s presidency was done in a peaceful way and reflected good citizenship. For instance, a high number of people who participated in the demonstration for their country also made sure to clean up after themselves when the protests ended. There is also an ongoing TV show called “Master of Living” that shows people who become experts in a seemingly mundane everyday chore or work (i.e. stamping labels, stacking tires, etc.) by diligently mastering their skill for several years. This reflects the developmental happiness and delayed gratification that is embedded in the culture during the Cold War era in South Korea. 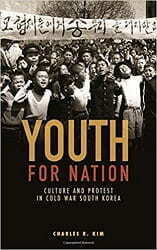 We highly recommend Charles Kim’s Youth for Nation: Culture and Protest in Cold War South Korea for readers interested in twentieth-century Korea, Cold War cultures, social movements, nation identity-building, or democratization in East Asia. We also hope you enjoy this movie that reflects the Cold War era in South Korea. The Love Marriage.